It’s been a great weekend. On Friday, I got home from work to a shiny new dishwasher. 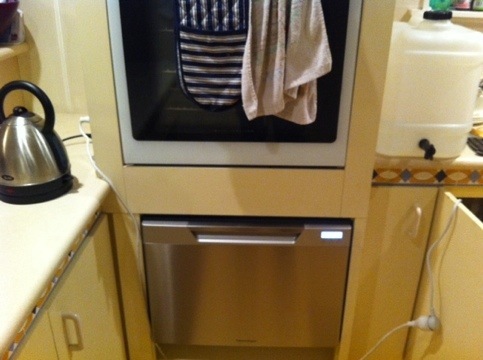 We had purchased a dishwasher a couple of months ago, and had been patiently waiting for the joiner and plumber to be available to install it. They’ve been a bit busy doing other more important things no doubt. The joiner also took out a cupboard in the kitchen, creating a space big enough for our ‘fridge – it was previously in the laundry. It makes a huge difference to my general happiness to have these two things fixed. And then, just to add to my general joy in life we noticed that our water pressure had been restored in the kitchen. We figured that it was related to the plumber tinkering with our pipes. But then Stephen went out the back yard and noticed silt all over the back path. He took a look in the drain and voila…no silt! We’ve been waiting for almost five months (and expect to be waiting for many more) to have someone look at our drains at the back of the house, so this was very exciting news. I ran the shower in our ensuite bathroom to test it. The water drained away. We had a working ensuite! The City Council, as a part of the work they’ve been doing fixing the sewer pipes, have also been blowing silt out of lateral water pipes. It doesn’t sound like a big deal really, but to me, this is HUGE news. We moved into our broken home fully prepared for a long haul before it would be fixed. These small things feel like moving on. They are epic luxuries. I love hearing about your new house! Even if it seems slow going, it’s completely fun to watch a house become a home.